We’d love your help. Let us know what’s wrong with this preview of The Christmas Singing by Cindy Woodsmall. Spend Christmas with the Amish in this s After Gideon coldly broke her heart, can the warmth of the season revive Mattie’s hopes? To ask other readers questions about The Christmas Singing, please sign up. is the book fiction or not? This slim little book packs a wallop and proves that Cindy Woodsmall can do concise without losing out on the depth and detail she is known for. Mattie is such a fun character -- and very different from your typical Amish heroine. Love her dreaminess, her klutziness, the way she can turn disaster into something fun and light-hearted. Except for her broken engagement that is. She knows how to harbour a grudge and I honestly can't blame her since she thinks one thing while the reality is far diffe This slim little book packs a wallop and proves that Cindy Woodsmall can do concise without losing out on the depth and detail she is known for. Mattie is such a fun character -- and very different from your typical Amish heroine. Love her dreaminess, her klutziness, the way she can turn disaster into something fun and light-hearted. Except for her broken engagement that is. She knows how to harbour a grudge and I honestly can't blame her since she thinks one thing while the reality is far different. I spent my time being alternately irritated and enamoured with Gideon. Honestly --he's...he's...just like a man!!!! Thinks like a man, acts like a man and believe me that isn't always a good thing! So there's fireworks at times, angst a plenty, but Woodsmall weaves it all together with some wonderfully heart-warming, light-hearted moments as well. A great combination for a Christmas read -- though there's not a lot of Christmas in the read. LOL. It's not as seasonal as I thought it would be, but that didn't detract from the story at all. In fact it makes it more universally appealing. Definitely not a book that has to be read only at Christmas. Believing that her boyfriend Gideon Beiler had betrayed her, Mattie Eash had fled from Pennsylvania to Ohio one Christmas. Now settled into her new life with her Ohio relatives, she has opened a cake shop and has a successful career as a cake-decorator, and a lukewarm relationship with reliable Sol Bender. But when a catastrophe drives her back to her home community in Pennsylvania, she finds herself face to face with Gideon again. As she prepares cakes for two of her friends’ upcoming weddings, she’s forced to spend time with her old boyfriend, who is building the home that one of the couples will move into once they’re married. Their encounters make Gideon wonder why he gave Mattie up all those years ago, and whether now would be the good time to tell her the truth about why he broke up with her. Will Mattie be content to reconcile with Gideon, or have past hurts hardened her heart too much to allow her to forgive him? This is your typical Christmas novel. The storyline has been done many times before, which makes it comfortable and reliable for the reader, but Cindy Woodsmall inserts a few changes here and there to make the story fresh and original. This has to be the first time that I've read a novel in which an Amish character makes and decorates cakes for a living, and I was equally surprised to read about another character that frequently went on hunting trips. I found it particularly refreshing to read about Mattie making a living for herself as a single woman. Most Amish novels don't go into much detail about the lives of the women who have to support themselves because they don’t marry young and don’t wish to stay at home and be a burden to their parents. Often crafts are shown to be hobbies that Amish women indulge in when they’ve finished with the day-to-day tasks of cooking, cleaning and raising a family, but there are many Amish women who do make their living from crafts such as quilting, sewing and in Mattie’s case, baking and decorating cakes. So it was encouraging to see Cindy revealing this often forgotten aspect of the lives of Amish women, and single women in particular. I’m not going to deny that the story of a couple who have been separated for years being brought back together by a great catastrophe isn’t somewhat predictable and sometimes over-done. I’m not a massive fan of storylines that are created out of a lack of communication between a couple, but this is partly because I’m fortunate to be a relationship in which there is a lot of communication between both partners. The reason why communication-driven plots are so popular in the romance genre is that it is one of the simplest and most common causes of problems between couples. Mattie and Gideon’s story also contained another plot point that I’ve witnessed a few times recently in romantic fiction; that of one person discovering that they have some sort of medical problem and breaking up with their significant-other in an attempt to protect them from suffering alongside them in their illness. While I struggled to relate to Gideon and Mattie’s relationship problems in this story, I’m certain that the issues of keeping secrets and failing to communicate over misunderstandings will strike a chord with many other readers. If anything, I hope that someone will read this book and come out of it with the revelation and understanding that secrets should never be kept between two people who love each other, and that no matter how difficult it is, communication is key in order for a relationship to survive. In all honesty, I wish this novella could have been longer. In discussing this book with my book group a lot of us felt that the shortness of the book limited the amount of time that Mattie and Gideon spent together on the page, and we really wished that we could have read about the day that they spent in each other’s company towards the end of the book. But this is the general issue with novellas – they’re short and sweet, but sometimes it just feels like there’s something missing. One thing’s for sure with The Christmas Singing, and that’s that I’ll be looking out for more of Cindy’s novels now that I know what her writing is like. A novella isn’t always the best example of an author’s work, but it’s often a good indication of whether you’ll like their books. So if you’ve never read any of Cindy Woodsmall’s novels before, The Christmas Singing may be a good place to start. It does contain a well-used storyline, but the characters refresh it and make it into something new and original. This is the perfect book to get you in the Christmas mood, especially if you enjoy romantic tales of reconciliation. Three years have passed since Gideon’s betrayal broke Mattie’s heart. Mattie’s moved on leaving her parents, friends, and Gideon behind in Pennsylvania. Living near her older brother in Ohio Mattie’s bakery is successful and she has a new boyfriend, one that will never break her heart! But in a moment of forgetfulness Mattie’s bakery is gone – destroyed by a fire. As Mattie waits for the insurance to settle up, she returns to Pennsylvania to visit with the family that she left behind. But it seems that everywhere Mattie goes Gideon is there too. Mattie is conflicted by her feelings for Gideon – she’s still drawn to her childhood friend and yet angry at the way he broke off their relationship. Gideon is still drawn to Mattie, but he knew that she couldn’t handle learning the true reason he broke up with her. Gideon felt lying would be kinder to Mattie than telling her that he had Leukemia and he may not survive. When Mattie learns the truth she loses her temper with Gideon, he didn’t trust her enough to make her own choices because he thought she was fragile. Because of Gideon’s deception Mattie chose Sol. But Mattie realizes that she chose Sol because he was safe and that she didn’t love him. But because of her commitment to Sol Mattie feels she must return to Ohio. Is it too late for love? Will Mattie follow her heart or will she choose safety? The Christmas Singing is a lesson in truth. We cannot protect the ones we love with a lie. Lies always hurt and the hurt is worse when the truth is made known. Truth is the most important foundation for any relationship! An Amish romance from Cindy Woodsmall, just in time for Christmas! Short and sweet, yet not sappily so, The Christmas Singing is sure to please. I read this sweet story in less than a day and enjoyed every minute of it. The pages turned steadily as I found myself fascinated and entertained with Mattie Eash's world. Mattie Eash is a young Amish woman with a gift for decorating cakes. But after her bakery burns to the ground and she goes home for the holidays, she comes face to face with her childh An Amish romance from Cindy Woodsmall, just in time for Christmas! Mattie Eash is a young Amish woman with a gift for decorating cakes. But after her bakery burns to the ground and she goes home for the holidays, she comes face to face with her childhood sweetheart, Gideon Beiler. Gideon broke her heart years before when she found him with another woman--an English woman. But Gideon has his secrets. Meanwhile Mattie plans her life with her current flame, Sol, a solid young man, who is an avid hunter. Lovers of Amish romance will eat up Ms. Woosmall's charming tale of love in Amish country. I really enjoyed reading about Mattie's beautiful cakes, I could almost taste them they sounded so good! Not to mention the fact that there are recipes in the back of the book! Cindy Woodsmall is a gifted writer, who brings all of the Amish charm, while also including the real feelings and struggles. I like to say that when I read Ms. Woodsmall's books, I relax but never fall alseep! Overall a very well done Amish romance that I highly recommend. The pages turned steadily for me and I completed it in less than a day :) A very well written book indeed. Every once in a while, you open a book, and the characters that emerge from the pages are living, breathing and believable. They take your hand and guide you through a story, making you laugh, making you cry, and always make it hard to turn that last page. Gideon and Mattie from Cindy Woodsmall’s The Christmas Singing are those kinds of characters. The story opens with Mattie, she’s the equivalent of the Amish Cake Boss. She’s moved to Ohio, after discovering Gideon in the arms of another woman. Every once in a while, you open a book, and the characters that emerge from the pages are living, breathing and believable. They take your hand and guide you through a story, making you laugh, making you cry, and always make it hard to turn that last page. Gideon and Mattie from Cindy Woodsmall’s The Christmas Singing are those kinds of characters. The story opens with Mattie, she’s the equivalent of the Amish Cake Boss. She’s moved to Ohio, after discovering Gideon in the arms of another woman. Her life with him had once been filled with “passion and gusto”, but now her shattered heart is on the mend. She’s the successful owner of a cake shop, and is involved in a “comfortable” relationship with Sol. But then tragedy strikes, and her store is burned down. She heads back to Ohio for the Holidays and is forced to confront Gideon. As the truth of his betrayal comes to light, will it mend the hurt, or bring more pain? I give this book five stars, and it is a must for your bookshelf this holiday season. One cold afternoon, curl up under a blanket and let the warmth of Gideon and Mattie’s story warm your heart. It is a quick and easy read that will bring a little joy to your day. Disclosure of Material Connection: I received this book free from the publisher. I was not required to write a positive review. The opinions I have expressed are my own. I am disclosing this in accordance with the Federal Trade Commission’s 16 CFR, Part 255. Mattie had finally picked up the pieces of her life, the life she had broken by her first love Gideon. or that is what she's been telling herself. Life is comfortable for Mattie, in which she's just too content too mess with at this point in her life. She moves to Ohio, in which she lives with her brother and his family at first. She gets her business, "Mattie Cakes" off and running, her dreams are coming true. She's doing really well, her business is booming til one day an accident forces her t Mattie had finally picked up the pieces of her life, the life she had broken by her first love Gideon. or that is what she's been telling herself. Life is comfortable for Mattie, in which she's just too content too mess with at this point in her life. She moves to Ohio, in which she lives with her brother and his family at first. She gets her business, "Mattie Cakes" off and running, her dreams are coming true. She's doing really well, her business is booming til one day an accident forces her to return home and face her past. Sweet. This is the word I would use to describe this story- sweet. It is a shorter story- it comes right around 200 pages and is easily read in one sitting. The pacing in the story was excellent and the story was well told. I found myself rooting for all of the characters. I loved that Mattie was a cake decorator- that doesn't seem to be a typical Amish character (from what I read). It was fun to read about all the cakes that she made. I especially enjoyed the recipes from the cakes mentioned in Sweet. This is the word I would use to describe this story- sweet. It is a shorter story- it comes right around 200 pages and is easily read in one sitting. The pacing in the story was excellent and the story was well told. I found myself rooting for all of the characters. I loved that Mattie was a cake decorator- that doesn't seem to be a typical Amish character (from what I read). It was fun to read about all the cakes that she made. I especially enjoyed the recipes from the cakes mentioned in the story. I really enjoyed this book! Great story of love and courage. This is a beautiful Amish holiday love story! Cindy Woodsmall does not disappoint in this lovely Christmas Romance. Gideon and Mattie are childhood friends and teenage sweethearts. Their hearts beat together as they enjoy all the wonders that wholesome youthful activities can bring. Until suddenly, Gideon shuts Mattie out. After Gideon goes home early after a Christmas Eve singing, Mattie visits him on Christmas day. She finds him with an Englisher woman in his arms. He breaks their relationship off abruptly. The story picks up in Mattie Ca Cindy Woodsmall does not disappoint in this lovely Christmas Romance. Gideon and Mattie are childhood friends and teenage sweethearts. Their hearts beat together as they enjoy all the wonders that wholesome youthful activities can bring. Until suddenly, Gideon shuts Mattie out. After Gideon goes home early after a Christmas Eve singing, Mattie visits him on Christmas day. She finds him with an Englisher woman in his arms. He breaks their relationship off abruptly. The story picks up in Mattie Cakes, where Mattie has built a business and a life for herself six hours away from her hometown. She has taken the craft of cake baking and turned into an art with countless hours of experimenting, planning, and implementing. Everyone loves a Mattie Cake. She has a new man in her life, Sol, a quiet man who has a passion for hunting. He lets her do her thing; she lets him do his thing. Convenient companionship, I'd call it. She still struggles with the anger and hurt that Gideon brought to her heart when he broke it three years later. What will happen when there is a sudden tragedy that sends her back to her hometown? Will her love for Sol survive seeing Gideon face to face again? Mrs. Woodsmall's relationships with women within the Amish community give her an insight into customs and details that many Amish genre novels do not include. I always feel like I'm right there; and, I'm part of things. The characters are not stiff and odd. They exhibit true to life emotions, fear, fatigue, exhilaration, tenderness, anger, hope, and love. I enjoy her books because I do not have to fear that there will be inappropriate themes or language. I feel safe. I'm a G rated reader. The backdrop of snow, sleigh rides, weddings, and Christmas makes this is an excellent book to slip into during the holiday rush for a relaxing read on a cool Autumn or Winter night. The Christmas Singing gives the reader exactly what they would expect - a heart warming story that is perfect for reading during the Christmas season. I needed a heartwarming story to curl up with, and believe me, it didn't disappoint. I found myself both charmed and captivated and was happy with the ending - it turned out exactly the way I wanted it to. If you love Amish or Christmas stories, add this one to your reading list. You won't be disappointed! This is the second novella in the Apple Ridge series. Mattie Eash, cousin to Beth Hertzler (co-owner of the dry good store in Apple Ridge), now lives in Ohio with her brother and his family. Her cake shop is doing well, and she is courting a local Amish man. However, when a disaster causes her to return home to Apple Ridge where she left behind a major heartbreak, Mattie's heart becomes more confused. This is a good story of love, forgiveness, and understanding. This was a sweet Christmas story. I liked the main characters in this story, and I liked that the main characters from the first book were in this one too. I was surprised by his, Gideon's, secret, and the ending was sweet. It made me smile. Also, I enjoyed reading about all the cakes that Mattie baked. They all sounded so delicious. I enjoy all Cindy Woodsmall books. I must say that this book was enjoyable only one could figure out everything that would happen in this book from the first couple of pages. I enjoyed getting to know all the characters better and learning more about their lives. The book kept my interest because of the other town folks, only sorry, the main characters were just too predictable. I always enjoy a great Amish romance set during Christmas. It's heartwarming and gets you in the Christmas spirit. The Amish lifestyle has always been fascinating and these books make you long for the simple things in life. Perfect for Chrismas. Required no deep thought. Happy Ending. Wonderful story, I truly enjoy the Apple Ridge series. Very sweet story of true love, loss, faith and cake! I love amish stories, and this one is done well. Loved it! A cute and wholesome Christmas romance. I was pretty disappointed since I loved "The Sound of Sleighbells"
Delightful little story. After growing up together and knowing each other. Gideon told Mattie they must go their seperate ways. A broken hearted Mattie keeps going and piucks up the pieces by seeing Sol. Her gift of decorating cakes keeps her busy until business goes up in flames . With Christmas on the way, I am all about Christmas stories. I had read "The Sound of Sleigh Bells: A Romance from the Heart of Amish Country" by Cindy Woodsmall several years ago and absolutely adored it. I loved it so much, I shared it with everyone who was interested. 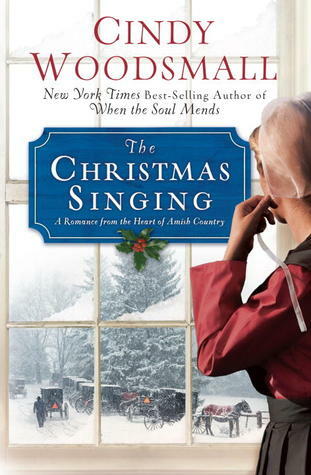 Because of the love of that book, I had to pick up "The Christmas Singing: A Romance from the Heart of Amish Country" also by Cindy Woodsmall when I saw it available via my library and the Overdrive app. Because I have a lot of h With Christmas on the way, I am all about Christmas stories. I had read "The Sound of Sleigh Bells: A Romance from the Heart of Amish Country" by Cindy Woodsmall several years ago and absolutely adored it. I loved it so much, I shared it with everyone who was interested. 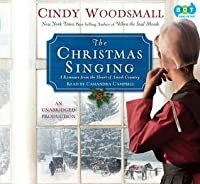 Because of the love of that book, I had to pick up "The Christmas Singing: A Romance from the Heart of Amish Country" also by Cindy Woodsmall when I saw it available via my library and the Overdrive app. Because I have a lot of housework to do, I chose to listen to the book rather than read it. Because I listened rather than read, I have a second part of this review that is simply based on production. There are few reads that delight me more than a look into the lives of the Amish. I have embraced this genre, and I have continually been delighted by each book I have read. The Christmas Singing has many of the elements that I enjoy from Cindy Woodsmall. The view into Amish life is painted so clearly I feel like I can see each detail. I was delighted with the descriptions as usual and wished I could drop into Mattie Cakes myself. I wish the shop and the village that Mattie lived in was explored more deeply before she went back to Ridge. I really enjoyed the descriptions and friends there. I hope to see more in a future work. I was also pleased to get the opportunity to catch up with other characters from Cindy's previous book in this series. It was like revisiting old friends. The tone of the story itself was a bit somber which I would as with it dealt with some negative events. It would have worked better for me (and this is purely personal) if it actually had not been a Christmas novella. I don't expect everything to be happy, but in a Christmas themed story, I expect it more than I would with other themes. Still the story itself was well written and I hope that my distraction with the tone doesn't lead you to think it was not. As for the characters, I would love to see what happens to Saul. He seems to have some deep levels there, and I hope the author will continue to explore them. Mattie herself kind of bugged me. She was hot and cold when it came to Gideon. I couldn't even grasp the momentary joviality that would be followed by resentment. I understood the reasoning, but to be honest, if I had been involved with someone who I truly believed betrayed me, I probably wouldn't be anything more than lukewarm around him. Polite out of necessity. Mattie's reactions often seemed very self centered and off kilter. Gideon and all he had been through simply broke my heart. All in all, I enjoyed the story and the look back at old friends. The ending for the main characters was satisfying, and I hope that it opens doors for others that I am also falling in like with. It was the perfect little getaway into Amish Country and I hope to go there again soon. I did listen to this book rather than read it, and because of this I do want to comment on that. I felt that the reader had a lovely tone to her voice but it was rather soft. Because of this, I had to turn my volume all the way up on both my Kindle and my computer. This is the first time I have had to do this with an audio book. Also because I was listening and not reading one name kept grating on me: Mattie Lane (Mattie's nickname). I am sure if I was reading it wouldn't have been so distracting, but it seemed to come up way too often as I listened. Heart broken from the break-up of her beloved Gideon, Mattie can’t figure out how she failed him so much to betray her. One minute her and Gideon are perfectly fine and happy, and the next he is cheating on her with Englischer girls. Catching him in the act and feeling as if her world crashed down around her she flees her hometown to get away from him and the pain inflicted. She moves to Ohio to live with her brother and his family. Only there does she start to blossom into the cake maker she d Heart broken from the break-up of her beloved Gideon, Mattie can’t figure out how she failed him so much to betray her. One minute her and Gideon are perfectly fine and happy, and the next he is cheating on her with Englischer girls. Catching him in the act and feeling as if her world crashed down around her she flees her hometown to get away from him and the pain inflicted. She moves to Ohio to live with her brother and his family. Only there does she start to blossom into the cake maker she dreamed to be, and opens her own shop called Mattie Cakes. There she finds Sol who is unlike Gideon in every way. Mattie takes comfort in the fact that Sol is reliable, and will never break her heart. She doesn’t care that there is no passion or gusto as there was in her relationship with Gideon as long as she doesn’t get hurt again. One day Mattie’s shop burns to the ground and she is forced to return to her hometown. While there she finds herself constantly thrown together with none other than Gideon Beiler, her former flame and the man who betrayed her to no ends. As they try to find ways to work around each other past hurts keep re-surfacing, and Mattie’s former passion for Gideon keeps trying to wiggle it’s way into her heart. Gideon has been hiding a secret from Mattie about their break-up as well as the whole town. Having joined the Amish faith he can’t afford for anyone to find out what that secret is. It just may be his undoing. This novel had me almost right away. I’m a huge Amish novel fanatic, and there is just something so intriguing about the Plain life. I greatly admire the Amish so I am drawn to novels as such. This was not only a wonderful portrayal of Plain life, but the characters are just so realistic you feel as if you are right inside the pages. There wasn’t one character big or small in this novel that felt unreal. Every character in a sense was a “big” character filled with such life and story. Mattie was so easy for me to identify with. She is so outspoken despite her Amish lifestyle. She is a fiery character that I’m sure every woman can identify with. I felt so many various emotions while reading this novel from compassion, regret, sadness, laughter, understanding, overflowing joy, admiration, etc. I do wish it would have given more background on Sol, even though he wasn’t technically a main character he was a big part of the novel. However it was still a beautifully done job. And it just goes to show that nobody’s life or relationship is perfect whether you be Englischer, Amish, etc. The romance in this book kept me on the edge of my seat, and the wonder at what would eventually happen. It also goes to prove that every relationship and every life has trials and tribulations that we all must overcome. And no matter what happens or what we think will happen what is meant to be will eventually be. A bonus is there are a couple of amazing cake recipes in the back that left me mouth watering, and anxious to try them out! Made from scratch cakes that require few ingredients and seem very simple indeed to make.